The location of some clocks were moved for the sake of consistency across all versions and for aesthetic purposes. 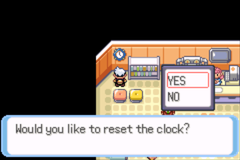 A script event was added to the clock in the Pokemon Center of the Battle Frontier. 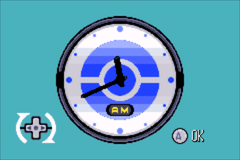 Clocks are now color-coded for each version; green for Emerald, red for Ruby, and blue for Sapphire. 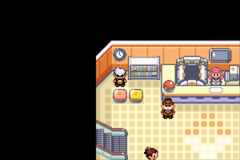 These patches were tested on the VBA-M emulator and GBA hardware with an EZ-Flash IV. All editing was done in Advance Map and consisted of creating a new palette and editing/moving/creating tiles. 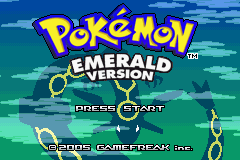 Also, for anyone that cares, Emerald gets upset when you edit its existing tiles. The tileset had to be enlarged by 8 and new tiles created to avoid graphical glitches. This fixes the problem of missing and/or corrupt tiles appearing in-game.